Just wanted to share some of the fab mini albums that have been sent in from our fabulous readers. If you have a mini scrapbook or altered project that you would like to share with the world then please send us a message or use our submit form to send your mini lovin our way. First mini we have is from Scrappin Wendy. 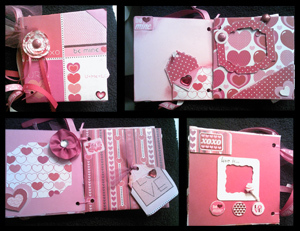 It is a sweet baby girl mini album that Wendy made for a friend for her first grandbaby. love baby albums and especially this little beauty. It's nice n chunky filled with lotsa pretty embellies. dig the bunting. bunting is soooo in. Next is Jessicas Contreras mini. This is Jessica's first mini album using cardboard.She found it was really easy to use and made a great first time mini maker project. She made it to put her daughters pictures in it for her dads gift from her. Jessica purchased most of the materials from target and Michaels. Great job Jessica! 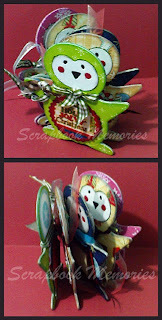 A funky Penguin shaped mini album for Christmas from Xinia Quesada . Pages were made with the Sizzix die cuts. 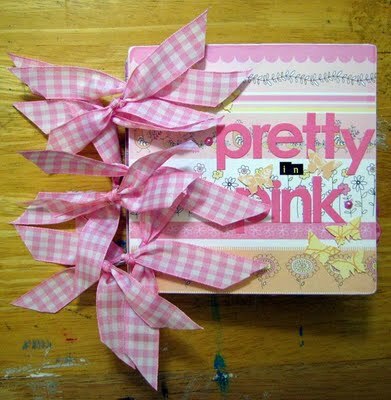 Sarabeth shares her mini album for a Spring Time themed swap-after an info exchange she realized that her swapping partner was really looking for a brag book of her Grand daugters photo shoot in pink gingham dresses. 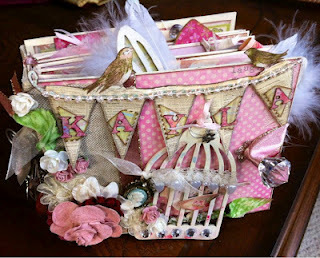 She used SEI's paper collection and the swap was hosted at 2Peas in a Bucket. Hope you like! 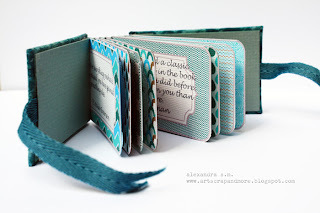 Luurve this fabric covered MINI of quotes made with printable labels. It is very easy and versatile. alexandra has a little tutorial that you can folow to make this mini. You can download the free printable labels that she used in the construction as well. Bonus! Ok this one is a little tricky. Jacira has sent us her Mini para as meninas which i'm pretty sure translates to a mini album for girls. I hope i got that right. Jacira tells me its a "Pequeno mini álbum em tons rosa e marron com tags e muitas fitas..." which i think means "Small mini album in pink and brown with many ribbons and tags" Please correct me if im wrong..
That's all for now. Thank you to all of you for sharing your minis with us. If you have an Easter Mini album or altered art project that you would like to share with us we would love to see it. Submit your project today! I'm reading: Readers Mini ScrapbooksTweet this!